When value betting you bet on the bookmakers overpriced odds. This means that you have a greater chance to win than the bookmakers odds imply. But it doesn’t mean you win every bet you place. Value betting is not about short term gains – it’s about making long term profit. It’s important to understand that value betting isn’t risk-free. You will still lose around half of all the bets you place since you only bet on a single odds and don’t cover all the outcomes of the game (as you do when arbitrage betting). But you will profit over time, since you bet on value bets with a positive expected value. This also means that you can’t expect a smooth profit curve. There will be variance and you will have to face downswings from time to time. We don’t want you to learn this the hard way, so better to be well informed so you know what to expect. It’s important to see value betting as a long-term way to profit. This simplified profit graph shows the impact of variance. Variance is a measure of the difference from the expected value (see image). A high variance means that you get steeper drawdowns. But it goes both ways as you will also see higher upswings. As long as you understand the concept of value betting and can handle the variance, there is no right or wrong in terms of approach. But if you are a beginner, you might want a smoother ride, so we recommend you to take actions to reduce variance. 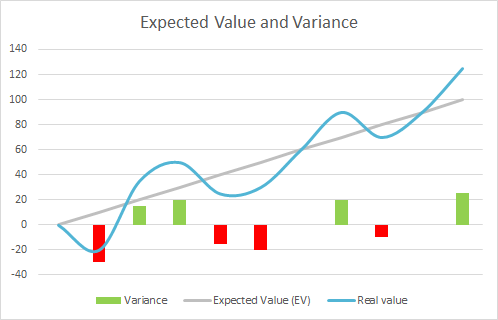 Read more about expected value (EV) and variance. Value betting is about volume. The number of bets placed play an important role to lessen the impact of variance. You shouldn’t evaluate your performance after just a couple of hundred bets. Over time, let’s say after a couple of thousand bets, your results will move closer to the expected value (EV). ValueBetting has a built-in staking strategy we recommend you use. This will ensure optimal profits for your risk tolerance. If you’re a beginner we recommend to start with 30% Kelly stake sizing. Using a higher Kelly will increase your profits but also the variance, so your downswings will also increase. Read more about Kelly stake sizing and how you can adjust it. Use a maximum stake on your bets combined with your Kelly stake sizing strategy to reduce variance even further. In the ValueBetting software the default max bet size is set to 1% relative to your bankroll. Example: You have a total bankroll of €1,000 and you set your max stake to 1%. ValueBetting will then cap your stake to €10, overriding the Kelly stake sizing suggestion (if it suggests a higher stake). Read more about max stake relative to your bankroll. If you turn over a significant part of your bankroll on any given day, you should update your bankroll more than once per day. This is because the Kelly stake sizing is calculated using the bankroll you have entered in the ValueBetting software. If your bankroll decreases, your stake size (and risk) will also decrease. But if you have half your bankroll in unsettled bets, and still calculate stake sizing based on your full bankroll, you might be taking more risk than you want. Read more on how to adjust your bankroll while betting to reduce risk. As you know, higher odds means a more unlikely win, but also higher profits when you do win. All this means larger swings in your bankroll. Setting a maximum odds to bet on is a good idea to reduce variance. You can start by setting a max odds of 2.5. If you place a bet a long time before the match starts, a lot can happen that affect the odds. Let’s say an important player is suddenly not in the starting line. This will affect the odds and also increase the variance. Therefore, bets placed closer to kick-off are more stable. The odds right before match start is known as the closing line. The closing line represents what the market believes to be the fair odds, meaning the true probability for the outcome of the match. Many value bettors take on a strategy that the longer it is until the match starts, the higher the percentage value you should bet on. The reason is that the longer it is until the match is played, the more information can enter the market that can change the odds. Low percentage value bets can swing back if you place them too early from match start. P.S Don’t miss to join your sports betting friends in the RebelBetting community. Share your profit results, discuss betting strategies and create new interesting topics.